Are (-ar?) you a noun or a verb? A friend of mine recently told me that the word "El" is a middle eastern or Jewish name for god. Names are nouns, and we all have one or more. We also have lots of names for god in an attempt to define him or it. There is even a name for 'Him' which is Elohim (El-ohim), which we could possibly pronounce as a question, "El?? Oh him!!" or "Oh, Him (again.)" BTW, questions are verbs, so maybe we should also be asking what is "is?" anyway?? We'll get to that in a moment. Meanwhile, is "is" Isis? But what if god is actually a verb, and the reason he is hidden from us is that we act like nouns instead of verbs by acting limited and defined? Maybe I'm fascinated by this naming question because my own name used to be pronounced the same as "bill item" and I quickly became a not very good bookkeeper. Subsequently, I started using my middle name of "Kelley." The name comes from the Irish word "Kell" which means a "Sacred Manuscript." 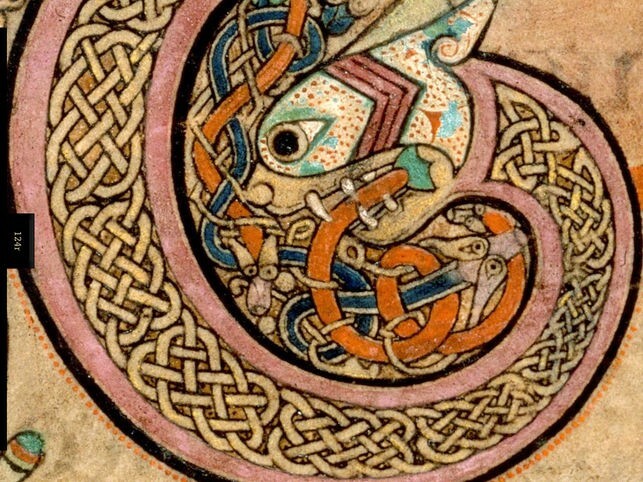 You have most likely seen pictures of the famously ornate "Book of Kells" with its dazzling artwork of the time. Do you see the hearts in the lattice work design and the fibonacci influence, plus the copper coil, and the third eye representation? Shortly thereafter I started writing, and subsequently wrote my first book. Prior to the name change, I'd dabbled in writing but it was extremely sporadic and incomplete. The first word in Chapter one of my book is Emanuel or "Emanu-EL." Dr. Revici was a verb who slept only two to three hours a night and gave his home phone number to all of his cancer patients during his 73-year active career. Revici was eventually crucified with his license temporarily taken away for about three or four years because his work offended the false gods who were in charge. Let's get back to nouns versus verbs to see if they might determine how our life unfolds. Do we label ourselves, other people, and things? Do that labeling limit us sometimes? Can a box become (be-come) a sailboat? That depends. Can we pull the box apart and make it into a boat by taking an action? Even then, does our sailing our action become* limited to the boat? *So we be-come. "Be" is classified as a verb of being that we human "be-ings" use to describe ourselves. From my personal examples, those descriptions can have power. The word "come" in this case describes our transformation from a noun into a verb which is a transformation from man to god. Let's take this a step further. The "Hu" in human happens to be a Sanskrit word for god. So is it possible that a "human being" is a hu-man, or god-man transforming? And was Isis, described as an Egyptian goddess, a folklore way to say she was like Wrigley's gum with double the flavor and double the fun? Was she two, too good? Her mission in life was to help others enter the Kingdom of god. That sounds like she had an action filled life. Was her advice "Be-come!" a double message to transform our noun selves into our verbs selves so we can "enter heaven." Welcome to my whirled! :-) Going to stop here because this might be too long already. Might add to it if time allows and if I can find some more verbs to verbify the verbiage. Meanwhile, keep on keeping on to that El-avator to the high way to heaven. Heave on up, heave on up to heaven. I might write a song about it. PS. "-ar" means "Pertaining to" such as a burglar is one who burgles. The word "Are" pertains to facts. so maybe there is an overlap there? But, but, but, isn't it called "The King's English?" P.S. El is persian or arabic. In each case, ithose words are the original language for that word in terms of its application at that time. It would be interesting to see what those words and others would be in Finnish or any other language because words are representations of real meaning in any language. So for example, what would the words "be" and "become" and the suffix "-ar" be in Finnish, and what would they mean? Supposedly clipped from tytär (“daughter”) and then adapted to vowel harmony. Forms the female counterpart of nouns indicating a person. This is a nominal suffix, i.e. attached to nouns. The suffix is appended to the weak stem. With words ending in -lainen, -tar is appended to the stem not including -lainen. Nowadays it's uncommon and old fashioned to use the female forms of professions. And while English, German and Swedish are all Germanic languages, the expression of 'being' is quite different. Great stuff, Octo! Right on point, too. (02-03-2019, 02:27 PM)Octo Wrote: And while English, German and Swedish are all Germanic languages, the expression of 'being' is quite different. Yes, they are quite different. The one exception would be the Swedish "ar" which relates to our are and to our -ar meaning pertaining to. German has a couple of "ist" forms which blends with our "is."